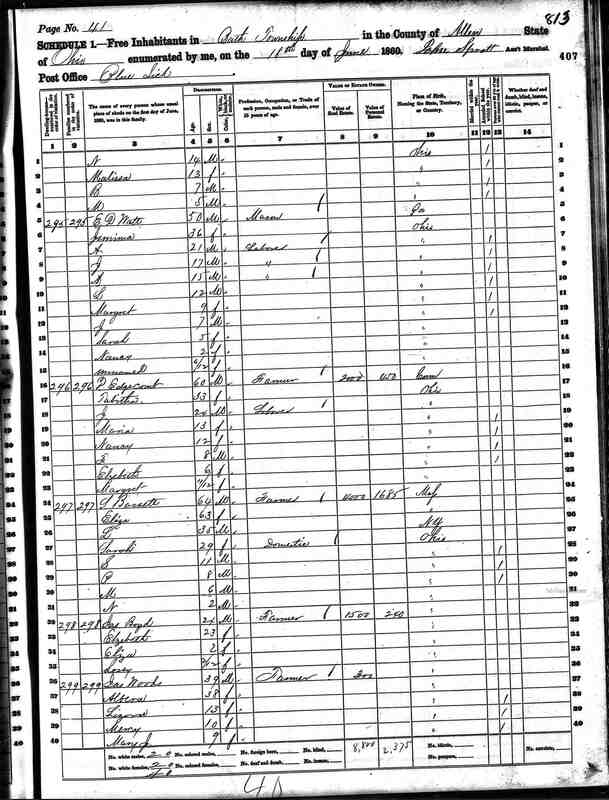 Sarah Edgecomb, daughter of Uriah and Betsey Edgecomb, and Lewis Bassitt, son of Samuel and Elsie (Lewis) Bassitt, were married on 29 Dec 1847.1 Their families were well acquainted - in fact Lewis' oldest sister Laura had married Sarah's older brother Walter seven years earlier. On April 4th of the following year, Lewis paid $107.20 to buy forty acres of land in section 12 of Bath Township from the State of Ohio. (This land had been granted by an act of congress to the state to aid in financing the construction of the Miami and Erie Canal. The canal, which connected Lake Erie with the Ohio River, was completed in 1845 and ran through the western edge of Allen County.) Lewis and Sarah settled down on this land, which is located northeast of the intersection of present-day Bluelick and Thayer Roads, and which adjoined the farm of Lewis' parents to the south. Samuel Harry,2 23 Oct 1848 - 9 Mar 1925, m. (1) Mary Margaret Whipp, m. (2) Lizzie Mitchell. Rozetta21, b. 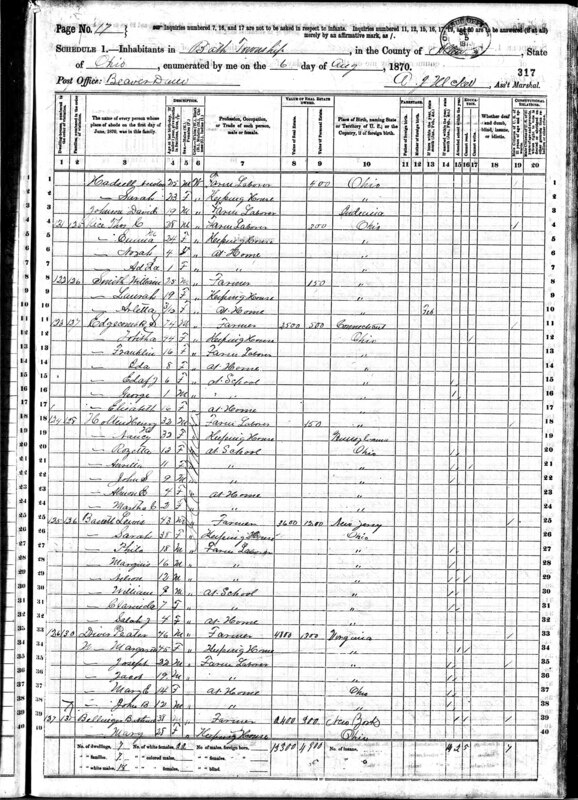 13 May 1850 in Bath Twp., Allen Co., OH, d. before 1860. James, 16 Feb 1857 - before 1860. Nelson, 23 Apr 1858 - after 1908, m. Katherine Burns. Carlinda Ann (Roeder), 1 Jun 1863 - c.1934, m. John Roeder. Sarah Jane (Flager),8 27 Apr 1866 - 13 Feb 1939, m. George Flager. Charles, 21 Oct 1868 - 27 Sep 18699. 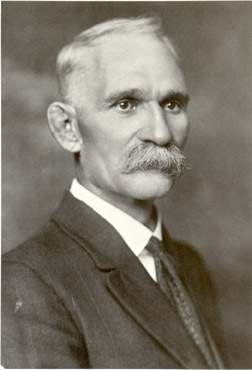 Lewis Ezra, 27 Jan 1871 - 1912, m. Anna Viola Burns . It is with the greatest of pleasure that i take my pen in hand to inform you that I am still on the land amonst the living and sincearly hope and trust that those few unworthy lines may find you enjoying the best of health I am not very well at the presant time I have had the fever and ague for the last three weeks but have got it about broke although I am awfull weak I am now detailed as a nurse tending to the wounded the is 9 wounded men in the room that I am in and out of the 9 the is 6 that have there legs off 5 of them are off above the Knee and one below the knee. ... I tell you now it is an awfull job they haft to be handled carefuller than a child for you can handle a child and them you cant. The was one man died in my room last night that had his leg off. ... The rebles calles us Shermans swamp dogs. With Sam far away in the army, a lot of responsibility fell on Philo and Marquis who were only 12 and 10. Samuel did come back to Ohio after the war, and the family was reunited again. Sometime in the 1870's, Lewis built a large house for his family on the farm. The house on the east side of Thayer Rd. just north of Bluelick Rd. is still standing there today and has been occupied by generations of the family through Lewis' great-great-great grandsons. 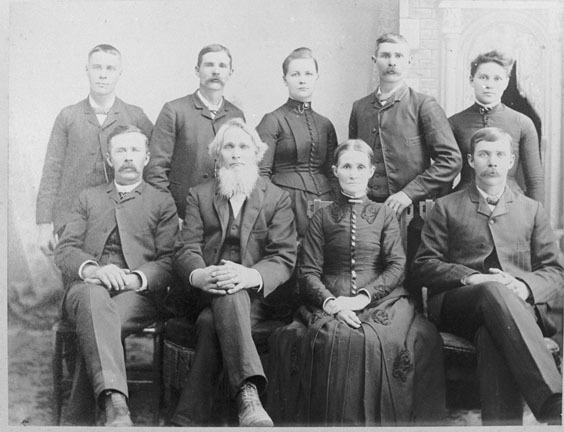 In about 1890, all of the children who lived into adulthood got together for a family photograph. Unfortunately, on that day Philo (who had quite a temper) was mad about something and refused to go and have his picture taken with the rest. Soon afterward, Sarah died on 1891 January 28, probably of cancer. A large portrait of Sarah was made from that family photograph; perhaps it was commissioned by her grieving husband. Lewis died on 25 March 1902 and was buried next to Sarah in the old cemetery on the east side of Beaverdam. How do you spell Basse/itt? 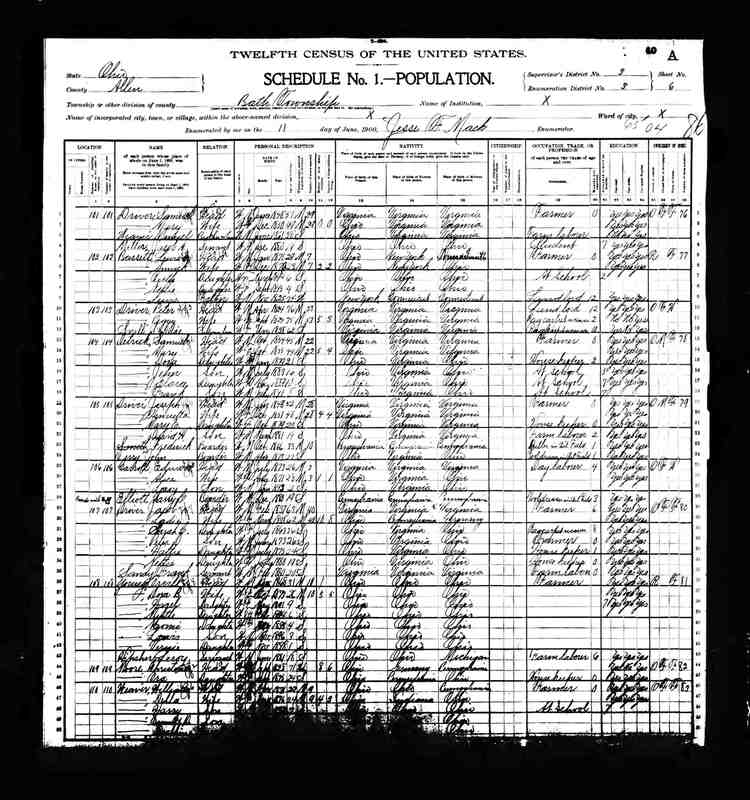 According to Frank G. Lewis, a genealogist working on Bassett genealogy in 1919, the spelling Bassitt is unique to the Allen County, Ohio Bassetts.20 All other Bassetts around the country spell the name Bassett. Since there were few other Bassetts in the area, people simply spelled the name the way it sounded: Bassitt, Bassit, Basset, etc. Samuel and Elsie had only one son, Lewis, and he and all of his family signed their name Bassitt into the 20th century. When Samuel and Elsa died, both of their tombstones were inscribed Bassitt. Although Bassitt seems to have been the accepted spelling, the spelling didn't seem to be an issue until about 1920 . Lewis and Sarah, who died in 1902 and 1891 respectively, share one tombstone, yet on one side it says Lewis Bassitt and on the other side Sarah Bassett. The "correctness" of the spelling of the name seems to have only become an issue with the grandchildren of Lewis and successive generations. Of the four sons of Lewis which had descendants bearing the family name, descendants of Samuel H. and Philo use Bassett, and those of Marquis and William19 use Bassitt. The greatest amount of "argument" (all in fun, of course) about the issue of spelling seems to be between descendants of Philo and Marquis. Perhaps this is because those two seem to have been the most stubborn of Lewis' sons! In defense of the -ett clan, everybody else does spell it that way. However the -itt branch claims that that is only because the -ett Bassetts are too lazy to dot the i. Only time will tell if the conflict will ever be resolved! This account was taken from History of the Edgecomb, Bassitt, and Snyder Families of Allen County, Ohio by Steven J. Bassett Baskauf, 2007. This portion of the book is freely available under a Creative Commons Attribution 3.0 License provided you give the citation listed above. On the web, a link to this page would be helpful. 2. Lois Bassett (DeWitt Bassett), BES family update 41 (1977). 3. Marvel Cheney Bielstein, BES family update 60 (1977). 4. Edythe Bassett Conaway and others, Philo & Alice Bassitt (Bassett) Family Members (unpublished, 2005). 5. 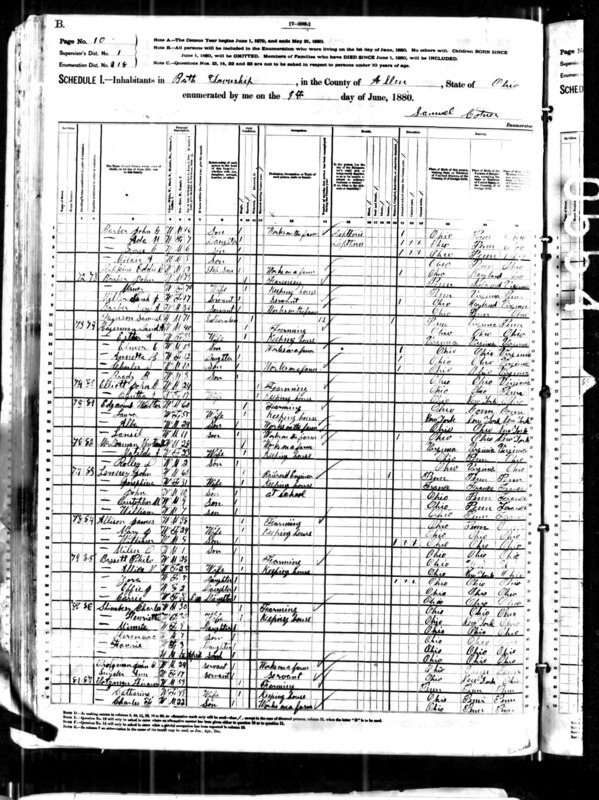 Karen Newman, Bassett and Bassitt Family from Lewis Bassett to Oak Bassitt, etc. (2004). 6. Alice Jane Burns Bassitt, BES family update 89 (1978). 7. Anonymous, Births and deaths recorded in the minutes of the Bassett, Edgecomb, and Snyder Reunion (1936-1975). 8. Eunice Growden Flager, BES family update 40 (1977). 9. Letter from Jeffrey N. Bassett to Steve Baskauf 6 Apr 1996. 10. Pledge of $5.00 to the American Bible Society by Lewis Bassitt of Bath Township, Allen County, Ohio, 1863 Sep 25. Located in the Genealogy and Family History files of the Allen County Museum, Lima, Ohio. 11. Some of the original letters are in the Allen Co. Museum, Lima, OH. Others are in the possession of Richard W. Bassett. 12. Civil War letters of Samuel Bassitt, written to family members from 1864 Feb 22 to 1865 Sep 12. The originals and typewritten transcripts are found in the Allen County Museum, Allen County, Ohio. 13. Letter from Samuel Bassitt to Lewis and Sarah Bassitt and family, Marietta, Georgia, 1864 Aug 25. 14. Letter from Samuel Bassitt to Lewis and Sarah Bassitt, Marietta, Georgia, 1864 Oct 16. 15. Letter from Samuel Bassitt to Sarah Bassitt, Marietta, Georgia, 1864 Nov 7. 16. Letter from Samuel Bassitt to Lewis and Sarah Bassitt, Chattahoochee River, Georgia, 1864 July 14. 17. Frank P. Edgecomb's Reminiscences, recorded 1944 October 29 by Mrs. John E. Breese. The transcript of this interview is in the Allen County Museum, Lima, Ohio. 18. Interview of DeWitt Simpson Bassett by Steve Bassett (Baskauf) on 1978 July 2. 19. William's daughter Helen Binkley used the spelling "Bassett". 20. Letter from Frank Grant Lewis to Charlotte Bassett, 1919 April 26. page 2. page 3. page 4. 21. The name "Rozetta" has always been somewhat of a mystery since it is a somewhat unusual name and there were no known relatives who also had this name. 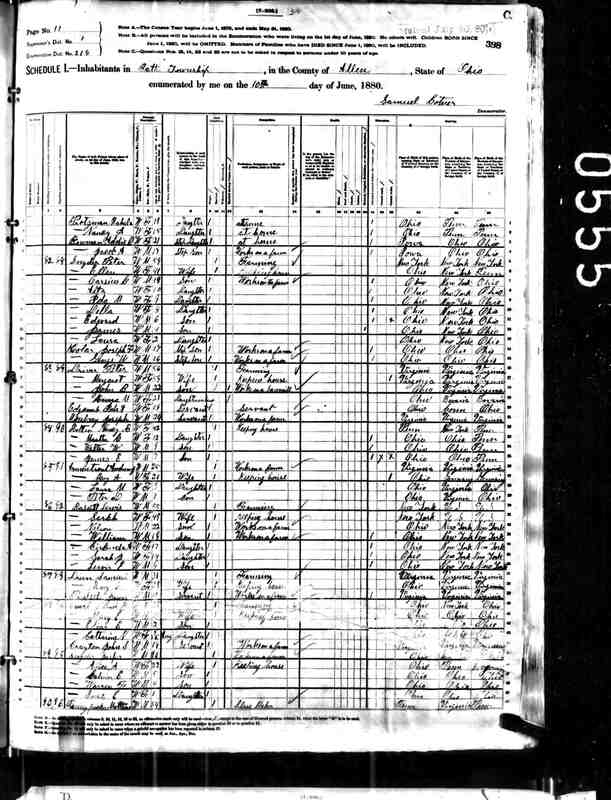 However, it now seems probably that Elsie (Lewis) Bassitt (mother of Lewis Bassitt) was a sister of Betsy (Lewis) Snyder. It also now seems likely based on circumstantial evidence that Peter and Betsy Snyder had a daughter Rosetta (Snyder) Richardson. If these suppositions are true, then Lewis Bassett and Rosetta Richardson would be first cousins. Lewis was a baby when his family moved to Trumbull County from New York in about 1826. 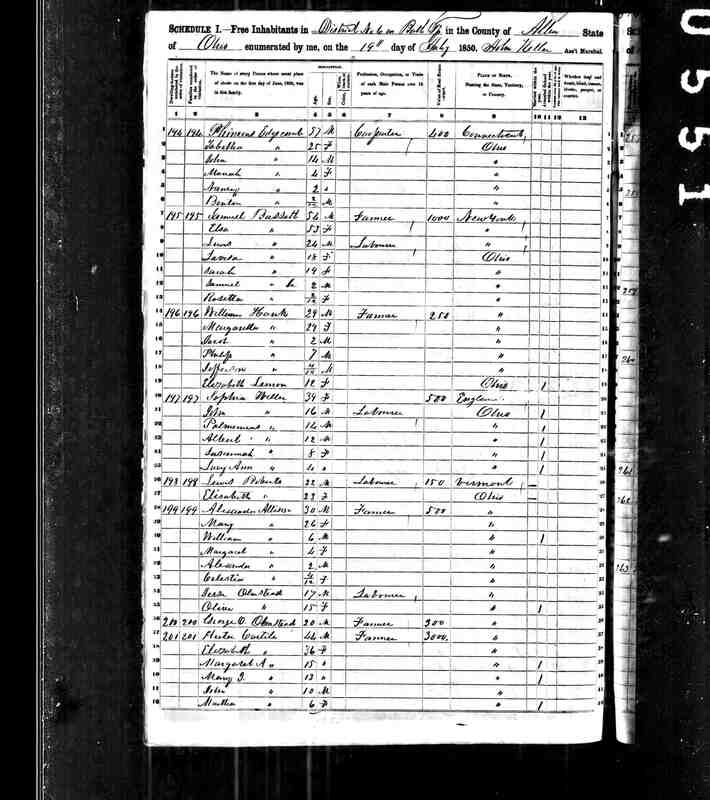 Mary Rosetta would have been about 10 years older than him and if her family moved to Trumbull County at the same time as the Bassetts (as I believe they did) and were neighbors (as I think they were), she might have been his older playmate or perhaps baby sitter for the first several years of Lewis' life. That may have inspired him to name his first daughter after her. See also sworn affidavits by Philo Bassett outlining family connections discussed in this section: from Abstract of the Title of Philo Bassett, 17 Oct 1903 and from Abstract of the Title of Claude G. Vore, 29 Mar 1927 (both originals in possession of Lewis E. Bassett).